I have spent uncountable hours of my life cooking chicken. Chicken with and chicken without. Chicken whole and chicken parts. Chicken roasted, broiled, grilled, sautéed, fried, sauced, souped, and brothed. (new word here.) Am I bored with chicken, you ask? No, in spite of umpteen ways of cooking chicken, I am not bored with it, and hope you are not either. I like to compare chicken to someone who is a “universal blood donor”, having something for everyone. (Sorry about the example, but I’m a medical person.) Everyone probably has a favorite dish that uses chicken in one form or another. 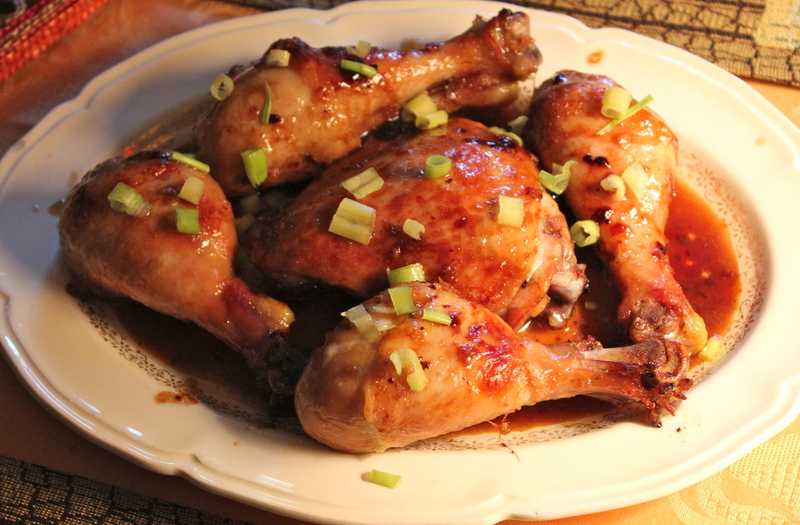 So, if all of the numerous chicken recipes already on this blog have left you feeling bleh, maybe, just maybe, this is the one that will compel you to march into your kitchen and start cooking. I particularly like this one because of the sauce. I’ve grown very fond of mustard sauces and paired with thyme, this is very good. It also makes enough to spoon over the chicken and rice, noodles or potatoes that you may serve with it. In my opinion, chicken with sauce is always better than chicken without. When I am using my oven to prepare an entree like this, I like to also make a side dish that will be oven cooked as well. The side dish I made was roasted red skin potatoes with green beans, since they cook at the same oven temperature as the chicken and for a similar length of time. Turns out they were a good accompaniment to the chicken. While all that was roasting in the oven I was able to make a salad to complete the meal. 1. Preheat the oven to 425*F. Lightly grease an 11 x 7-inch glass or ceramic baking dish. 2. Heat a large nonstick skillet over medium-high heat. Add oil to pan; swirl to coat. Sprinkle chicken with 1/4 teaspoon salt and 1/4 teaspoon pepper. Add chicken to pan; cook 4 minutes on each side or until lightly browned. Remove chicken from pan and place in the prepared baking dish. Bake at 425*F for 16 minutes or until a thermometer registers 165*. 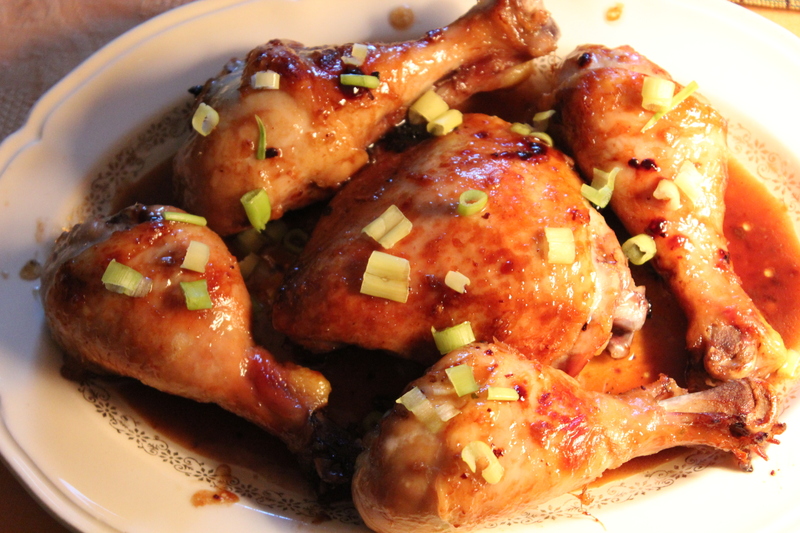 Remove chicken from dish and reserve the drippings. 3. Return skillet to medium-high heat. Add butter; swirl to coat. Add onion and thyme; sauté 5 minutes or until tender. Combine 3 tablespoons chicken broth with the flour in a small bowl. Add flour mixture, remaining broth and reserved drippings to pan, scraping pan to loosen browned bits. Bring to a boil and cook for 2 minutes or until slightly thickened. Remove from heat, and add mustard, remaining 1/4 teaspoon salt and 1/4 teaspoon pepper, stirring with a whisk. Serve sauce with chicken. To make the Roasted Potatoes with Green Beans: Wash and quarter 4-5 red skin potatoes, and place in a shallow baking dish. Add in about 10 oz. fresh green beans and 2 thinly sliced garlic cloves. Drizzle over the top 1 tablespoon olive oil, 1/4 teaspoon salt and 1/4 teaspoon pepper and toss to coat well. Bake at 425*F for 25 – 30 minutes, stirring once. Pierce the potatoes with a sharp knife to test for doneness. Serve with chicken, spooning the sauce over all. Roast potatoes with green beans.